There isn't much in the way of storage that can touch the maximum speed that Thunderbolt 3 can deliver and keep pushing the data at that speed, but the Akitio Node Lite with Intel Optane SSD and Thunderbolt 3 comes very close —without thermal slowdown. 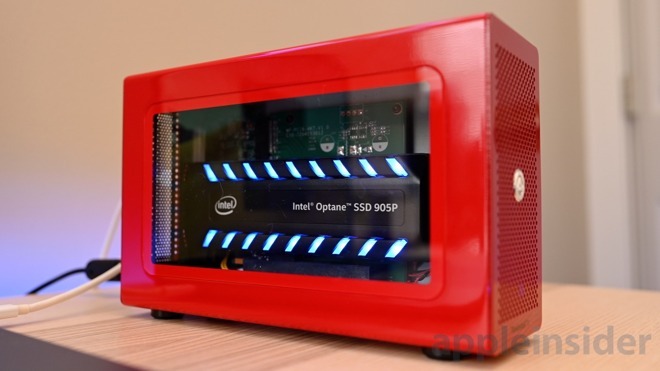 Akitio partnered with Intel for this special edition of the Node Lite PCIe enclosure, which differs itself not just with the Intel drive but the firetruck red exterior and clear side panel. Packed inside is an Intel Optane SSD 905P that is blazing fast and has a 960GB capacity. Of all the Thunderbolt 3 drives we've reviewed, the Intel Optane SSD is far and away the most capable, and doesn't get bogged down by frustrating slowdowns induced by thermal throttling. The chassis holding everything together is the Akitio Node Lite. Akitio, who was just recently acquired by OWC, is known for excellent Thunderbolt 3 peripherals and has a non-red version of the Node Lite available that is a bit less showy. 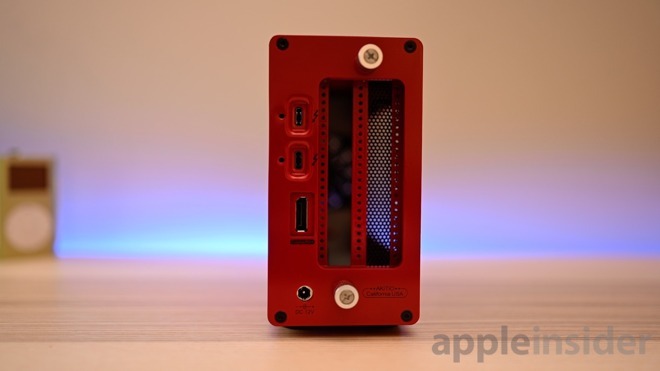 It is a PCIe enclosure that will hold any PCIe card —assuming it draws 75W of power or less. 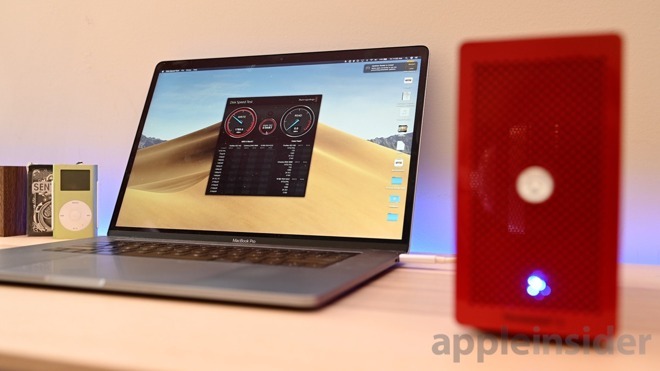 What sets this special edition apart is that bright exterior and the clear acrylic panel along the left side that allows a look at the innards of the enclosure, including the colorful LEDs along the SSD. Both the Intel Optane SSD 905P and the Akitio Node Lite come separately, which leaves the installation up to the user. It only takes a matter of minutes by loosening the thumb screws on the back of the enclosure and sliding it out towards the front. The card slots right in and is held in place by yet another thumbscrew. Then, the whole process is reversed to close it up. The front of the enclosure has a ventilating grille with a fan hiding behind it. While using the drive, we found the default fan a bit loud —especially when recording podcasts or voiceovers —so this is something you may way to optionally swap out down the line. Along the back, you have a trio of ports at your disposal. There are dual Thunderbolt 3 ports which makes this a great enclosure for daisy-chaining with lower-demand peripherals. 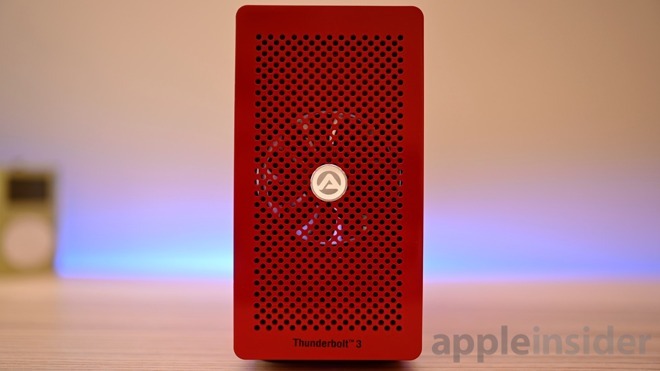 If you have another Thunderbolt 3 drive or a Thunderbolt 3 monitor, you can connect those to the Akitio Node Lite, then the Akitio Node Lite to your Mac. Additionally, the DisplayPort connector on the back of the Akitio Node Lite lets you connect another monitor there as well. We used the Akitio Node Lite and the Intel Optane 905P SSD for a variety of tasks, but most often video editing. While working in Final Cut Pro X, we saw huge speed gains in our workflow, especially when returning from a sleep state. It made transfers significantly quicker than a standard hard drive RAID configuration. When we transferred a 4.6GB file from our Mac to the SSD, it was so fast the file transfer window barely had a chance to appear before the file was transferred. This is hard to demonstrate in text —but the video covers it nicely. 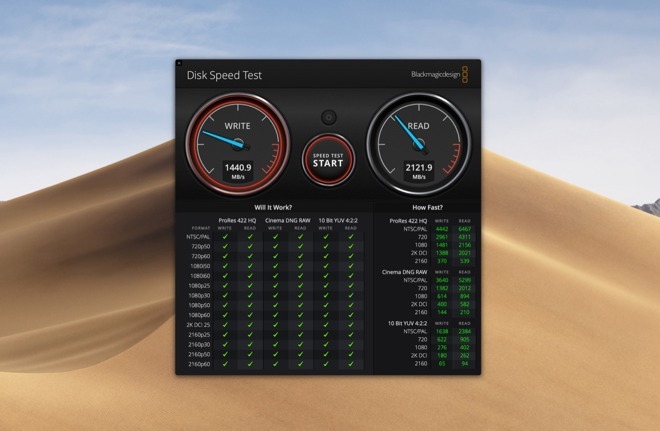 To get a more concrete reading of the SSD performance, we turned to the Blackmagic Disk Speed Test. We ran the test multiple times after piles of file transfers, trying to keep the heat on the drive up. No matter what we threw at it, the files transfers at the end were as fast as the ones at the beginning. In the Blackmagic test, we saw consistently fast scores on both read and write. Write speeds averaged around 1740MB/s and read speeds averaged just shy of 2100MB/s. Those are insanely fast speeds, above what nearly any other drive can put out —especially at long intervals. As we mentioned before, the fan here is a bit on the loud side. This is less than ideal but helps ensure there is no thermal throttling of the SSD. Luckily, Intel has done a great job with the heat sink on the SSD. You can see the thermal paste in between the drive and the heatsink that helps facilitate this. Because of the stellar passive cooling, the fan isn't as necessary as it would be with other PCIe cards. That said, if you find the fan too loud, just unplug it. We did, and we noticed no impactful drop in performance. If you do want to be doubly sure there is no dip in speeds, swap it out for a quieter off-the-shelf model. Using both Thunderbolt 3 ports, we daisy chained additional Thunderbolt 3 drives and an LG UltraWide monitor and only saw slight dips in actual drive performance as bandwidth was allocated to the other peripherals. 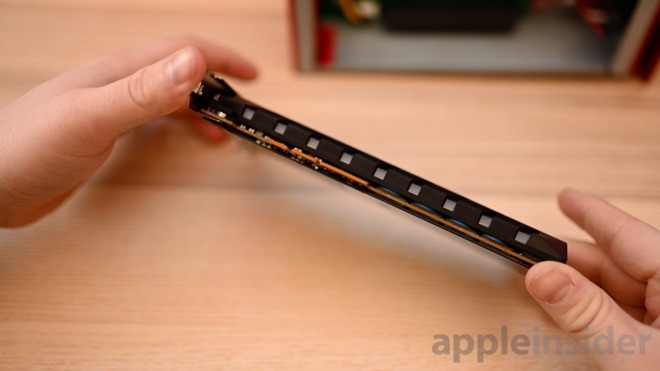 One complaint we had was there was no way to control the lights on the side of the SSD. We love the bright, vivid blue, but at night or in low light it is a little eyeball-searing. Especially if you are trying to deal with color correction and a bright blue light is being cast on your display. Many times we had to use a piece of cardboard to cover the transparent panel. If you are on Windows, there is an Intel utility that can tweak the colors and turn them off, but Mac users are left out in the cold. If you don't want this to be a burden, opt for the silver or black model of the Akitio Node Lite. Most users out there aren't going to need the high levels of performance of the Akitio Node Lite with the Intel Optane 905P SSD. There are other SSDs that offer solid performance that don't cost as much and will work just fine. However, if you want to go all-out, there isn't much better you can do. 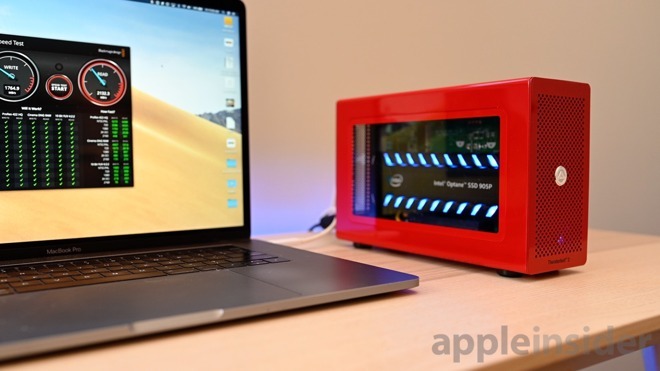 If you want to max out your workflow, you can grab the red Akitio Node Lite Thunderbolt 3 PCIe enclosure for $299.99 on Amazon. The basic silver version is slightly cheaper at only $217.99. Lastly the wonderful Intel Optane 905P SSD $1,261.22.